Accepted Scientific Name: Mammillaria weingartiana Boed. Origin and Habitat: Mammillaria weingartiana is reported from the state of Nuevo León, Mexico, where it grows near Ascención and Juanito de Solis. It is somewhat common where it occurs. Altitude range: 2,000 to 2,300 metres above sea level. Habitat and Ecology: This species is known from flat, meadows with numerous ant nests. It grows together with Opuntia rastrera, Opuntia tunicata, and Asphodeline lutea. There are not any major threats, but M. weingartiana faces a significant threat from illegal collection for the international trade. 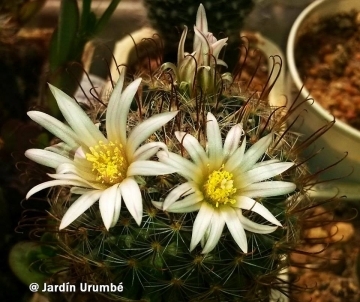 Description: Mammillaria weingartiana is a small spherical cactus with wonderfully dark hooked central spines contrasted against white radial spines. It can either grows solitary or within small groups. It starts showing buds in the autumn, but these will not develop much before late winter or early spring. The pale greenish-yellow to cream-yellow flower are about 1 cm long. M. weingartiana probably require short days to initiate bud formation and is able to maintain growth at rather lower temperatures than other Mammillarias. It may be of significance that most of the plants falling into this category have heavy tuberous roots, which function for storage purposes rather than for the transport of moisture and nutrients. It starts the year out by putting out a ring of flowers, sometimes as early as the end of December, continues into February and March, and repeats this performance several more times during the year. Stems: Globose, tuberous below, dark green, slightly glossy. In habitat the plants are to 4-5 cm across, and only the flat top of the plant is above ground level while in cultivation they usually develop a globose above ground stem, but and you can get the same flattop effect in cultivation if you give the plants a lot of light. Tubercles: Slender conical, sub-truncated, without latex, axils naked. Areoles: At first with few white wool, soon becoming glabrous. Central spine: One at first, hooked, later 2-3, straight, yellow to dark reddish brown, the main central to 12 mm long the other shorter. Radial spines: 16-25, white, straight, very thin, 6-8 mm long, horizontally spreading. Flowers: Pale greenish yellow to creamy yellow, but also white or light pink, with pink to pinkish brown midveins on some petals, with fringed margins, 7-10 mm long and in diameter. Fruits: Small, club shaped, red. 5) Hernández, H.M., C. Gómez-Hinostrosa and B. Goettsch. 2004. "Checklist of Chihuahuan desert Cactaceae." Harvard papers in botany 9(1): 51-68. 6) Hunt, D., Taylor, N. and Charles, G. (compilers and editors). 2006. “The New Cactus Lexicon.” dh Books, Milborne Port, UK. 7) Pilbeam, J. 1999. “Mammillaria.” Cirio Publishing Services, Southampton. 8) Fitz Maurice, W.A. & Fitz Maurice, B. 2013. Mammillaria weingartiana. The IUCN Red List of Threatened Species 2013: e.T40854A2937207. http://dx.doi.org/10.2305/IUCN.UK.2013-1.RLTS.T40854A2937207.en. Downloaded on 28 September 2016. 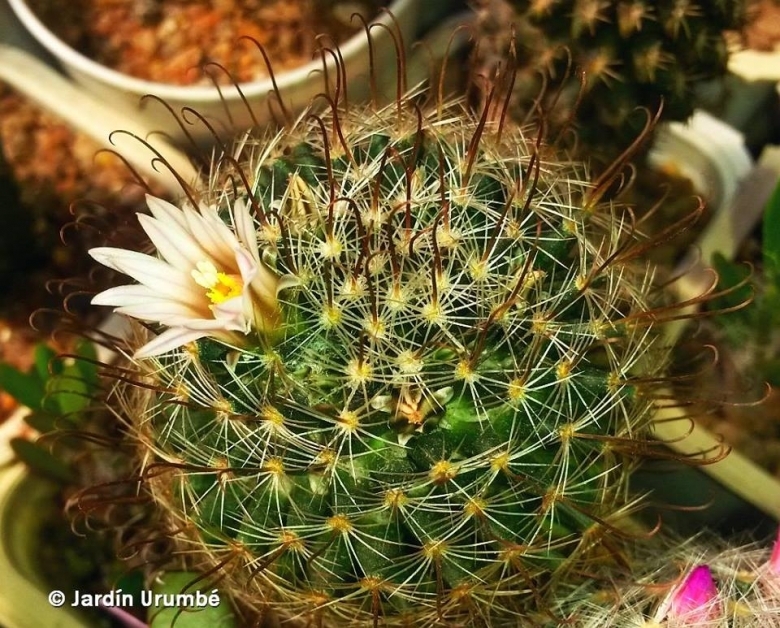 Cultivation and Propagation: Mammillaria weingartiana comes from an area of summer rainfall. This plant is seldom seen in collections, perhaps because it has a deep tap root, making it rather vulnerable in a pot. Make sure to give it sufficient room and perfect drainage. Kept dry over the winter. It is quite cold resistant, but the frost resistance varies a lot from clone to clone. It can be grown outdoors in areas with minimum winter temperatures of -5°(-15°) C. It needs full sun to light shade. Growth rate: It is slow growing. Repotting: Repotting every 2-3 years, or sooner if the roots get crowded. As it is prone to rot under-pot in a smaller container filled with very porous compost. Use pot with good drainage. Hardiness: It is quite frost resistant if kept dry, hardy as low as -5° C (some reports give it hardy to -15°C or even less, , but the frost resistance varies a lot from clone to clone.). However some warmth throughout the year will increase the grower's success (minimum 5° C during rest season). Exposition: Outside bright sun, filtered sunlight or afternoon shade, inside it needs bright light, and some direct sun. High levels of light are needed to flower and for good spine development. Can be sunburned if moved from shade/greenhouse into full sun too quickly. During the spring it may be able to take full sun until the heat arrives at the end of spring. In an area that has hot afternoon sun, it may be able to take full morning sun, but requires afternoon shade or afternoon light shade. 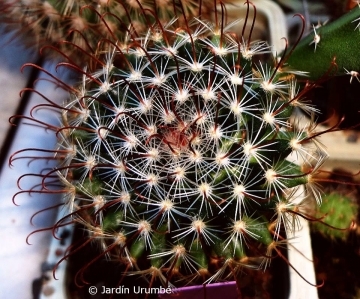 Prest and dieseases: Mammillaria weingartiana is prone to rot, but rot it is only a minor problem if the plants are watered and “aired” correctly. If they are not, fungicides won't help all that much. Propagation: Direct sow after last frost or (usually). Seeds germinate in 7-14 days at 21-27° C in spring, remove the glass cover gradually as the plants develops and keep ventilated, no full sun for young plants! The seedlings should not be disturbed until they are well rooted, after which they can be planted separately in small pots.